Defining the difference...Harmony between high quality material and latest technology. Oyade Electric has a firm design concept for making cables without compromise. Oyaide always pursues superior performance and produces products with a nonconventional novel concept. They make tradition while succeeding to it. Oyaide has made the ACROSS 2000 with a new concept and firm design thought. The ACROSS 2000's architecture is an independent parallel layout, as well as other innovations, and an exterior of rich ceramic white color. 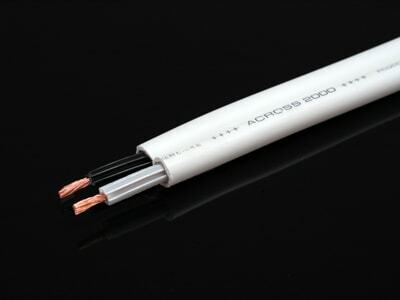 The conductor of ACROSS 2000 is PCOCC-A (Pure Copper by Ohno Continuous Casting). The PCOCC-A has the same concept as PCOCC. However, it was updated in response to audiophile needs and the trends. The cable structure is PCOCC-A Multi-Stranding-Structure to balance flexibility with density by seven ideal distributions. Furthermore, each conductor is twisted in a reverse direction, which minimumizes noise. Special attention was made to mount an insulator of developed C.I.S structure, virtually eliminating vibarations, and improving the electric characteristics. The exterior adopts a Halogen-free sheath for exclusive use of an audio system, developed newly by Furukawa Elec. and the ACROSS 2000 also utilizes a conductor of high quality and a new material structure of Furukawa Electric. The PCOCC-A developed by Furukawa Electric. This is an ultra pure single crystal copper originally developed by Professor Ohno. It was then further evolved into PCOCC utilizing a single copper grain wire. This design results in an extremely low level of signal disturbance and loss factor due to the lack of crystalline borders in the signal path. Oyaide has further evolved this technology with a highly controlled heating and cooling process and improved surface management to realize a mirror finish. It is now called PCOCC-A and it is the epitome of Japanese craftsmanship. The C.I.S structure supports the central conductors. As a result, the mutual interaction of a center conductor and the outside sheath is suppressed to a minimum. The ACROSS 2000 is the result of an idea to free the conductors from the sheath's vibration. Furthermore, the C.I.S structure makes not only a superior stabilizer, but also enhances the electrical characteristics, and reduces the electrostatic capacity of the cable. The leading part of ACROSS 2000 is signal transmission unit PCOCC-A of 2 sq mm in a parallel arrangement. The 7 X 7 stranding, makes the conductors more stable and removes random gaps between the wires. As a result, it minimizes and suppresses distortion. Furthermore, the conductors are twisted in a reverse direction to further minimize and suppress noise. ACROSS 2000 is excellent at transmission performance and passes a signal precisely. ACROSS 2000 has the advantage of the improvement of wideband power, and transmission loss is reduced. It also has very low capacitance (24.7pF/m 1kHz), so it is safer to use for longer runs without running into capacitance problems. As for jacket of the ACROSS 2000, the sheath material was supplied with the cooperation of Furukawa Electric, too. The halogen-free sheath conforms to the RoHS directive. It enables pure signal transmission with a high vibration attenuation characteristic by virtue of the ratios of the material. The conductor insulation used is polymer polyolefin. The dielectric constant is 25 perecent lower compared to PVC, and random space was removed between the insulator and conductor.